Comments: Deciduous broadleaf tree native to California. Slow growing to 100 feet with massive trunks. The largest Oak in North America. This tree was preserved when housing was built along Mission Blvd. 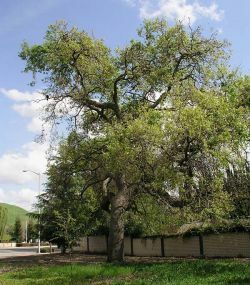 This tree is rare to the flat areas of Fremont, but common in the adjacent hills.